Runtime: 2 hr. 33 mins. Harry Potter has learned to live with his bullying Uncle Vernon, his callous Aunt Petunia and the constant whining of his greedy, spoiled cousin Dudley. He's even learned to live with sleeping in the cupboard under the stairs. Harry's relatives have just as reluctantly learned to live with the unwelcome presence of their orphaned relation, a constant reminder of Petunia's "wayward" sister and brother-in-law and their mysterious and untimely demise. Even the impending arrival of his 11th birthday offers no excitement for Harry- as usual, there's little chance of cards, presents or any kind of birthday treat. This year, however, is different. 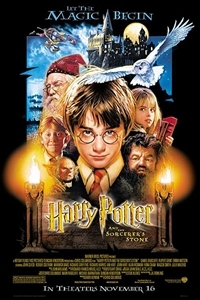 On his 11th birthday, Harry learns that he is the orphaned son of two powerful wizards and possesses unique magical powers of his own. Invited to attend Hogwarts School of Witchcraft and Wizardry, Harry embarks on the adventure of a lifetime. At Hogwarts, he finds the home and family he has never had. The winsome adaptation of J. K. Rowling's hit children's book about the fantastic and magical adventures of a boy whose life is changed forever when he finds out he's a wizard. Poor, poor Harry Potter. Orphaned as an infant, he's been raised by his beastly aunt and uncle who keep him locked in the room under the stairs and make him serve breakfast. But 11-year-old Harry (Daniel Radcliffe) has always known he was different, a fact confirmed in a big way when he's invited to enroll at the Hogwarts School of Witchcraft and Wizardry. Despite his horrid family's protests, Harry's whisked off by a giant named Hagrid (Robbie Coltrane) to the magic school, where it seems he's something of a celebrity. Turns out his parents were killed by a wicked ''fallen wizard,'' who, despite his mighty powers, was somehow unable to kill the baby Harry. It will eventually fall to Harry to stop the malevolent sorcerer who still roams the countryside, plotting to get hold of a magic stone secreted inside Hogwarts that will give him absolute power. Meanwhile, Harry makes some new friends in bossy Hermione (Emma Watson) and affable Ron (Rupert Grint), becomes a star player of Quidditch (like hockey on broomsticks) and defeats a troll rampaging through the girls' bathroom. Unfortunately, Radcliffe brings nothing spectacular to a role that requires it. You don't like him or dislike him; he's a bland Harry who simply reacts (without the sheer amazement you expect from an 11-year-old boy) to the wild and crazy situations he's suddenly immersed in. By contrast, Watson carries off her officious Hermione with aplomb and personality, as does Grint (who looks startlingly like a young Hayley Mills) as Harry's bumbling, loyal buddy. The rest of the enormous cast throw themselves into their we've-seen-these-characters-before roles with gusto: Richard Harris as wise old headmaster Dumbledore, Maggie Smith as a prim and proper schoolteacher, Tom Felton as Harry's smarmy, arrogant rival Draco. Best in show goes to Coltrane as the amiable giant, who gets the most screen time of all the adults as he helps Harry along on his journey of discovery. A pageboy'd, goth Alan Rickman as sly Professor Snape is good, too, but underused. Chris Columbus certainly had his work cut out--remain true to the fanatically revered book, or attempt to interpret its magic? As one might expect from the director of Mrs. Doubtfire and Stepmom, he took the high road and gives us the book, almost word for word (you practically expect Rowling herself to pop on-screen to narrate). It makes for a safely predictable movie but lacks the enchantment of discovery. John Williams' slick, grandiose and too-loud score doesn't help, either. As it turns out, the best special effects are in the not-so-obvious details--pumpkins and candles suspended in the dining hall, moving pictures on the walls--rather than the cheesy Cerberus guarding the stone and ghosts like Nearly Headless Nick (John Cleese's cameo), which move about like Disneyland holograms. Even the overlong Quidditch game looks fake-y; the players zoom through a blue sky that might as well be the blue screen. Lots of unanswered questions will remain after you leave the theater: why is Snape such a jerk, and how come Harry didn't once use the precious wand he's given, except to stab the troll in the nose? If you enjoyed the book (or at least can take some kids with you who did), go watch it played out on screen--just don't expect magic to happen.